VIBO VALENTIA – A former local election candidate, Matteo Vinci, who campaigned in the region of Calabria, has been killed in a car explosion, police said on Tuesday. His father, Francesco Vinci, remains severely injured whilst the Carabinieri follow indications of the 'Ndrangheta’s involvement in the blast. Preliminary investigations have shown that an explosive device was placed in the boot of the vehicle and could have been activated by remote control. 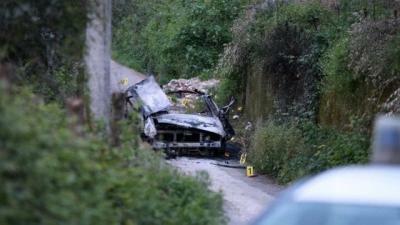 The bomb was detonated yesterday afternoon whilst Matteo Vinci was driving his Ford Fiesta along via delle Fosse Ardeatine, a country road near Vibo Valentia. The vehicle was totally destroyed, taking the life of Matteo amongst the flames whilst his father was able to escape. The first people to arrive at the scene reportedly tried to help both victims, but Matteo’s life was already irretrievable at this point. Francesco is currently in hospital in Vibo Valentia, recovering for the explosion, but is suffering from serious burns across 30 percent of his body. Domenico Di Grillo, with alleged links to the 'Ndrangheta mafia, has been arrested following last night’s incident. The 71-year-old, who is the married to Sara Mancuso, sister of the 'Ndrangheta-associated clan’s boss and neighbour to the Vincis, was seized by the Carabinieri in Limbadi on charges of illegal possession of weapons and ammunition. Police are investigating past links between Di Grillo and Matteo Vinci, who stood in the 2015 local elections under the movement “Free and Democratic Limbadi” and his father. The families’ connection dates back to 2014 when they had a public dispute over land surrounding the property of Sara Mancuso, which has intensified over time. Corriere della Sera reported that the conflict boiled over in Nov 2017 when an altercation between the neighbours, Sara Mancuso and Francesco Vinci, left the latter wounded and both ended up in behind bars, although they were later released. Limbadi, is known to accommodate one of the strongest networks of mafia-related activity across Calabria, with the undeniable presence of the Mancuso clan. The Vibo Valentia public prosecutor and a magistrate of the anti-mafia prosecution office in Catanzaro have immediately stepped in to support the investigation. Guido Longo, the prefecture in the region, has called an urgent assembly of the Provincial Committee for public order and security in order to hold critical discussions on the event, hoping to establish whether the attack was targeted specifically at one of the victims.